GOP Tax Reform — What's in it for Appalachia? GOP Tax Reform — What’s in it for Appalachia? In the early hours on Saturday, the Senate passed the GOP’s tax reform bill. The vote fell primarily along party lines, with all 48 Democrats voting against the bill, alongside the sole Republican Senator Bob Corker of Tennessee. The final version of The Tax Cuts and Jobs Act was sent to Senate members only hours before the vote, provoking outrage among Democrats. Last minute negotiations, including some handwritten amendments on the margins of the document’s official printout, were added throughout the night leading up to the vote. Now, the bill is headed for reconciliations with the House’s own plan passed last month. According to the Congressional Budget Office, the new plan will add almost $1.5 trillion to the budget deficit over the next 10 years. Here’s the CBO’s full report. So what does this all mean for the taxpayers of Appalachia? According to the CBO’s analysis, individuals earning more than $30,000 a year will not benefit from the new GOP tax plan. The Appalachian Regional Commission’s report on Personal Income Rates (per capita) in Appalachia in 2015 estimated the median income per capita to be $38,953. This means that even Appalachian Kentucky, which had the lowest per capita income of $31,291 that year, would not see any tax cuts or advantages from the plan. 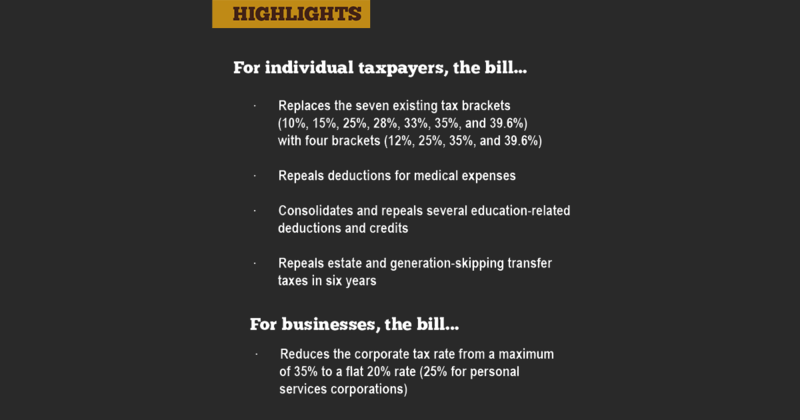 An analysis from The New York Times indicates that the legislation may impede local and state governments’ ability to levy their own taxes, which in turn would impact revenue funding for services such as health care, public safety, and public education. Various other provisions are also expected to impair social security safety net programs and programs designed to help lower-income groups gain access to higher education. It appears changes to the tax code designed to limit the government’s reach and spending might have the most detrimental impact on Appalachia’s most vulnerable communities. For example, the permanent repeal of the individual mandate (a penalty for not acquiring health insurance coverage) will significantly reduce revenue funding for Obamacare. Almost every analysis of the new tax plan suggests that it will primarily benefit high-income earners and big corporations. The GOP intends to deliver the bill to the President’s desk before the end of the year. This story was originally published by the Ohio Valley ReSource. West Kentucky Farmer Barry Alexander doesn’t have an answer on when the Trump administration will reach a trade deal with China, now a year into tariffs that have hamstrung some Ohio Valley industries. Listen to the story from the Ohio Valley ReSource. Alexander is optimistic these continued negotiations will be worth it, but his plan in the meantime lies in massive, silver storage bins on Cundiff Farms, the 13,000-acre operation he manages. He pulls a lever, and out tumbles a downpour of pale yellow soybeans. He’s been trying to hold onto about half of his soybean and corn bushels, waiting to see if he can sell for a better price before he’s forced to start planting again in early April. 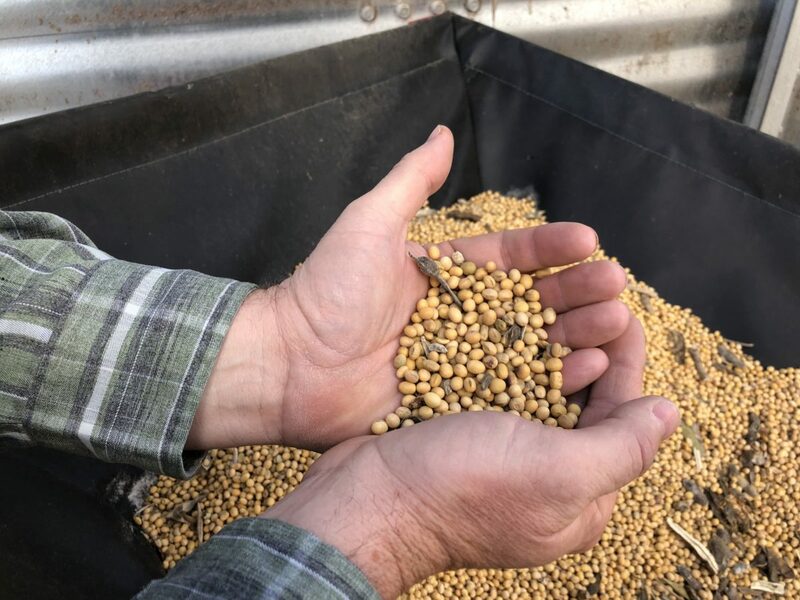 Crop prices have crashed partly because of Chinese tariffs, and the losses have put a strain on some farmers he knows. “There are farmers that have decided to retire because they didn’t want to work through these things now. We’re to that point,” Alexander said. Alexander said he’s survived in part because his sprawling farm has resources to work with: eight full-time employees, two new $550,000 combines he traded up for, and the storage bins to help ride out bad crop prices. “Our large structures are not cheap, but financially for our farming operation, they’re a necessity for us to do what we do,” Alexander said. Farmers like Alexander are coping with losses from tariffs and a continuing trade war, and it’s not clear when it will end. A March 1 deadline for negotiations with China was delayed indefinitely by President Trump, and an agreement with Mexico and Canada that Trump signed in November has yet to be ratified by Congress. The retaliatory tariffs on U.S. crops and dairy remain, compounding problems caused by overproduction and low crop prices, and small farmers are suffering the most. Sharma and others argue grain prices have been low for five years because farmers are overproducing, and tariffs are only making the situation worse. Both Ohio and Kentucky set records for soybean harvests in 2018: 289 million bushels and 103 million bushels, respectively. This is up significantly compared to two decades ago, when Ohio harvested 162 million bushels and Kentucky harvested a little over 24 million bushels in 1999. Farmers are also becoming more efficient than ever before — Ohio set records in 2018 for most corn and soybean bushels produced per acre. Oversupply problems haven’t been limited to grains, though. Small dairy farmers are also dealing with excess supply and tariffs, with hundreds of cases of extra milk being dumped at Ohio Valley food banks. Greg Gibson’s operation is small, but his family has made it work for decades. He milks 80 cows at his dairy farm in Bruceton Mills, West Virginia, and he took over the operation in 2002. The past year of tariffs hasn’t been easy. Like many Ohio Valley farmers, Gibson is receiving payments from the $12 billion in federal relief from the Market Facilitation Program intended to to help those who suffer losses from tariffs. Gibson appreciates Trump’s efforts to renegotiate trade deals, and like Alexander, is cautiously hopeful about the prospects of new trade deals. But he said he’s also disappointed in Trump because the payments are not nearly enough to recoup his losses. He says milk’s price has plummeted nearly a dollar per hundred pounds of milk sold and the payments only reimburse 12 cents of that. “I would have rather him said ‘I got to do this. You’re going to take the hit. Sorry.’ Don’t promise me you’re going to take care of me and then don’t,” Gibson said. Some commodity associations including the National Corn Growers Association and the National Milk Producers Federation have called on the Trump administration in past months to bolster what they call lackluster relief payments. Gibson’s squeezed budget has had him extend paying off his farm loans and put off paying several repair bills. He’s also had to put up his 150-year-old family farm as collateral for his loans. Farm lenders say Gibson’s situation isn’t unique right now. Senior Vice President of Agricultural Lending Mark Barker helps oversee lending for Farm Credit Mid-America, which serves most of Ohio and Kentucky. Barker said while most people are making their loan payments right now, the rapidly increasing amount of debt farmers are taking on to deal with depressed prices is concerning, especially for smaller operations. U.S. Department of Agriculture economists predict nationwide farm debt will reach $263.7 billion in 2019, levels of debt not seen since the 1980s farm crisis, when thousands of farm families defaulted on their loans amidst a trade embargo with the Soviet Union and high loan interest rates. Tom McConnell leads the Small Farm Center at West Virginia University’s Extension Service and tries to help small farms succeed, in a state that has the highest proportion of small farms in the nation. He’s lived through the 1980s farm crisis and saw many dairy and beef farmers lose their farms. He said one solution for small farmers to withstand these depressed prices is to switch to crops that bring a higher value, like vegetables. But those can be more labor-intensive, and the transition can be difficult. “If you’ve been in a family that has milked cows or grown row crops for three generations, and I suggest you grow three acres of sweet corn and five acres of snap beans, there will be some resistance to that,” McConnell said. McConnell said it might take a new generation to redefine what a successful small farmer business model can look like. One of those younger small farmers is Joseph Monroe, who moved from Indiana to central Kentucky to raise beef cattle and grow tomatoes and greens. Monroe believes a way forward for smaller farms is to find ways to work together to sell products and have a greater market impact. With the natural gas fracking boom, plastics production is spreading in the Ohio River Valley. But at what cost to health and climate? MONACA, Pennsylvania — Along the banks of the Ohio River here, thousands of workers are assembling the region’s first ethane cracker plant. It’s a conspicuous symbol of a petrochemical and plastics future looming across the Appalachian region. More than 70 construction cranes tower over hundreds of acres where zinc was smelted for nearly a century. In a year or two, Shell Polymers, part of the global energy company Royal Dutch Shell, plans to turn what’s called “wet gas” into plastic pellets that can be used to make a myriad of products, from bottles to car parts. Two Asian companies could also announce any day that they plan to invest as much as $6 billion in a similar plant in Ohio. There’s a third plastics plant proposed for West Virginia. 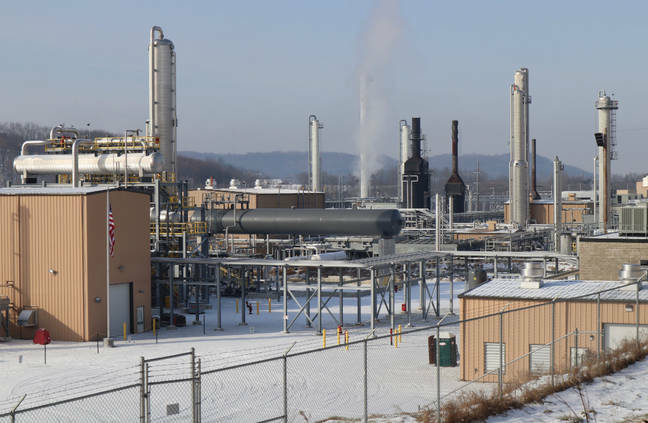 With little notice nationally, a new petrochemical and plastics manufacturing hub may be taking shape along 300 miles of the upper reaches of the Ohio River, from outside Pittsburgh southwest to Ohio, West Virginia and Kentucky. It would be fueled by a natural gas boom brought on by more than a decade of hydraulic fracturing, or fracking, a drilling process that has already dramatically altered the nation’s energy landscape—and helped cripple coal. But there’s a climate price to be paid. Planet-warming greenhouse gas emissions from the Shell plant alone would more or less wipe out all the reductions in carbon dioxide that Pittsburgh, just 25 miles away, is planning to achieve by 2030. Drilling for natural gas leaks methane, a potent climate pollutant; and oil consumption for petrochemicals and plastics may account for half the global growth in petroleum demand between now and 2050. Despite the climate and environmental risks, state and business leaders and the Trump administration are promoting plastics and petrochemical development as the next big thing, more than three decades after the region’s steel industry collapsed and as Appalachian coal mining slumps. “We have been digging our way out of a very deep hole for decades,” said Jack Manning, president and executive director of the Beaver County Chamber of Commerce. “When Shell came along with a $6-to-$7 billion investment … we were in the right spot at the right time,” he said. Everyone wants jobs and economic growth, said Cat Lodge, who works with communities in the Ohio River Valley affected by the shale gas industry for the Environmental Integrity Project, a national environmental group. But not everyone wants them to be based on another form of polluting, fossil fuels, she said. Lodge and her husband moved from Pittsburgh to the countryside 18 years ago in search of fresh air and open land. They have a small farm in a corner of rural western Pennsylvania, where winding roads trace the contours of Appalachian hills and a stark transition fueled by a shale gas boom is underway. “We still love it, but little by little, and quickly over the last several years, we have become totally surrounded by the oil and gas industry,” she said. The natural gas that’s pulled from deep underground in the Utica and Marcellus shale formations has done more than outcompete coal for electricity generation. Drilling companies have also extracted a lot of natural gas liquids, particularly ethane, also called wet gas. It’s used to produce ethylene, which then gets turned into plastics, providing an additional revenue stream for the oil and gas industry. It’s the industry’s latest play, and it comes at a time when industry analysts and the federal government say the demand for plastics is skyrocketing. IHS Markit calls the Appalachian or upper Ohio River region “the Shale Crescent.” Last year, it reported that the region’s gas supplies could support as many as five large cracker plants, like the one Shell is building. The plants “crack” ethane molecules to make ethylene and polyethylene resin pellets and would be in close proximity to a number of manufacturers that use those products to make everything from paints to plastic bags. The oil and gas industry might find themselves with stranded assets, needing to abandon Ohio River valley communities, said Lisa Graves-Marcucci, a Pennsylvania-based organizer for the Environmental Integrity Project. She said she is also worried about such a major investment in oil and gas as the world grapples with the effects of climate change. The idea for a plastics hub in Appalachia got a lift in December with a reportto Congress from the U.S. Department of Energy. It described a proposal for the development of regional underground storage of ethane along or underneath the upper Ohio River. Storage is needed to help provide a steady and reliable stream of ethane to ethane cracking plants, and it would be important for the development of a regional petrochemical complex in the upper Ohio River valley, the report concluded. A West Virginia business, Appalachia Development Group LLC, has proposed developing storage for ethane, possibly in mined salt or limestone cavernsdeep underground. It’s in the second phase of an application process for $1.9 billion in loan guarantees from the Department of Energy for the project, according to the department. The Energy Department is thinking big, too. Its report projects ethane production in the Appalachian basin would continue rapid growth through 2025 to a total of 640,000 barrels per day, more than 20 times greater than five years ago. By 2050, the agency said ethane production in the region is projected to reach 950,000 barrels per day. China Energy signed an agreement with West Virginia in 2017 to potentially invest $84 billion in shale gas development and chemical manufacturing projects in the state. Late in January, West Virginia’s development director, Mike Graney, told state senators that China Energy was looking at three undisclosed “energy and petrochemical” projects. An announcement could be made later this year, he said, though President Donald Trump‘s trade war with China was causing delays. Other experts see a natural gas industry that’s subject to booms and busts and question whether the region is headed down another unsustainable path, like coal. “We are less optimistic than the industry that this will really boom out,” said Cathy Kunkel, an energy analyst with Institute for Energy Economics and Financial Analysis, an environmental think tank that just published a reportdetailing how the natural gas industry in West Virginia hasn’t lived up to earlier expectations for jobs and tax revenue. The Energy Department report also cited “security and supply diversity” as a benefit of developing a new plastics and petrochemicals hub in Appalachia. The bulk of U.S. plastics and petrochemical plants are currently along the Gulf Coast, where they face supply disruptions caused by hurricanes, it said. Vivian Stockman, the interim director of the Ohio Valley Environmental Coalition based in West Virginia, called that a “hugely ironic” justification for an Appalachian plastics hub, since science is showing that global warming can intensify hurricanes. The Shell plant was lured to Beaver County by Pennsylvania officials with some $1.65 billion in tax incentives. It’s scheduled to open “early next decade,” company spokesman Ray Fisher said. This year, as many as 6,000 construction workers will be working on it, and Shell says it plans 600 permanent jobs to run the plant. It’s in Potter Township, a community with fewer than 700 residents. Rebecca Matsco, who chairs the township commission that gave Shell the local zoning permits, said she sees the plastics plant as an industrial upgrade from a dirty zinc smelter that had stood on the property for about a century, and that Shell cleaned up. “It had become a real environmental burden, and we do feel like Shell has been a real partner in lifting that burden,” Matsco said. Others, however, see the cracker plant as its own environmental burden—a new source of emissions that cause lung-damaging smog and heat the planet. People in Pittsburgh were sad to see so much of the steel industry go, but they don’t miss the dirty skies, said Graves-Marcucci, an Allegheny County resident. The economic resurgence that followed was centered around health care, academic institutions and cleaner industries, she said. Pittsburgh has been brushing off its sooty steel city past and is now pledging to slash its carbon emissions. But the Shell cracker plant alone, just 25 miles away, would emit 2.25 million tons of carbon dioxide a year, effectively wiping out nearly all the gains in carbon reduction that Pittsburgh plans to achieve by 2030, said Grant Ervin, Pittsburgh’s chief resilience officer. The Shell plant will also emit as much smog-forming pollution as 36,000 cars driving 12,000 miles year; that would equate to about a 25 percent increase in the number of cars in Beaver County, said James Fabisiak, an associate professor and director of the Center for Healthy Environments and Communities at the University of Pittsburgh. The environmental and health threats will only increase with a plastics hub buildout, and no regulators are looking at those potential cumulative impacts, Graves-Marcucci said. About 70 miles southeast of the Shell plant, another community waits for news about what could be the region’s second major ethane cracker plant, in Belmont County, Ohio. PTT Global Chemical, based in Thailand, and its Korean partner, Daelim Industrial Co., Ltd., could announce any day whether they intend to proceed with an ethane cracker plant after getting state permits in late December. That plant would be along a section of the Ohio River in Belmont County where hulking old manufacturing plants and shuttered businesses paint the very picture of the nation’s Rust Belt. “Do you know what the biggest export is from Belmont County? Our youth,” said Larry Merry, an economic development officer with the Belmont County Port Authority, overlooking the Ohio River bottomlands where the cracker plant would be constructed on the cleared-away site of a former coal-fired power plant. But it’s not fully made up for losses in steel and coal, and this cracker plant “is about jobs and opportunities so people can make the most of their lives,” he said. He brushed aside any concerns about climate change or too much plastics. “How are we going to live and have products? Until you come up with a solution, don’t expect the world to shut down,” he said. A spokesman for PTT American said he could not say when an investment decision will be made. A third potential cracker plant is planned for Wood County, West Virginia, but it has been delayed because of unspecified “challenges” with its parent company, the Department of Energy report said. White is also a pilot, and he said he has observed from the cabin of a Cessna 3,000 feet aloft the spread of oil wells, pipelines and processing plants across shale drilling zones in Pennsylvania, Ohio and West Virginia, slicing up farms and encroaching on homes, schools and businesses. “We are just in the way,” he said. This article was originally published by Inside Climate News. The transition to clean vehicle technologies such as electric vehicles will benefit consumers everywhere, promising lower operating and maintenance costs, along with less pollution and a cleaner environment. But the drivers with the greatest economic potential to gain by purchasing an electric vehicle are the residents of small towns and rural counties. Drivers living outside of urban areas often have farther to travel to work, shop, and visit a doctor. They have to repair their vehicles more frequently, they produce more carbon emissions per capita, and they spend more money on gasoline￼￼. As a result, rural drivers have the greatest potential to save money by making the switch to an electric vehicle. Overall, rural residents have the potential to save up to twice as much as urban residents by making the switch from a conventional sedan to an electric vehicle. In addition, rural residents who drive pickup trucks and SUVs have the potential to dramatically cut their fuel costs and emissions through programs to encourage efficiency and electrification. Using data from the 2017 National Highway Traffic Survey, we created a model that approximates what vehicles are being driven, and for how many miles, in every county in the Northeast and Mid-Atlantic region. This data allows us to approximate the average cost and emission savings from an electric vehicle in each county. We also mapped out some of the differences in vehicle miles traveled that form the basis of these calculations (see below, our full methodology is here). Overall, we find that in our most rural counties, the average driver will save $870 per year and cut carbon dioxide emissions by more than 3 metric tons per year by choosing an electric vehicle over a conventional sedan. That is almost twice the average emissions reduction from an EV in our most urban counties. Bringing clean vehicle technologies to rural areas will not only benefit rural drivers, but it will also improve whole rural economies. Nearly all the money that we spend on gasoline and diesel fuel ultimately leaves our towns and our region, for other parts of the world. As electric vehicles replace the internal combustion engine on our roads, there will be more money in consumers’ pockets – which means more jobs, and more local development for our small towns. Unfortunately, although rural residents have the greatest potential to save from purchasing an electric vehicle, currently EV sales are concentrated in urban areas and inner suburbs. As of 2017, people in urban areas and inner suburbs report that they are about three times more likely to own a plug-in vehicle compared to people in rural areas. Rural drivers share many of the same challenges in selecting an electric vehicle as urban and suburban drivers: not many consumers are aware of how easy it is to make the switch to an electric vehicle, and the charging infrastructure is inadequate. These concerns are particularly acute for rural drivers, who on average need to travel greater distances between charging stations and destinations. Rural drivers do have one major advantage over urban drivers: they are much more likely to have access to offstreet parking, which should make installation of a home charging station easier. In addition, rural drivers may have additional concerns about electric vehicle technology, such as the ability of electric vehicles to provide adequate performance in cold weather climates (hint: EVs are great in cold or inclement weather) or to provide enough range to deal with rural driving distances. Some of these concerns are being addressed through improvements in technology: at 200+ miles, cars like the Chevy Bolt and Tesla Model 3 can serve the daily driving needs of residents of all areas. But even as the technology improves, cultural assumptions about what kind of vehicle is appropriate in what kind of area may remain. As more electric vehicle models come to market, and vehicle costs continue to drop, rural drivers will have increasing choices in vehicle types from SUVs to pick-up trucks. But an EV may not work for every rural household today. Fortunately, automakers compelled by vehicle efficiency standards have been bringing more efficiency gasoline and diesel cars and trucks to market. 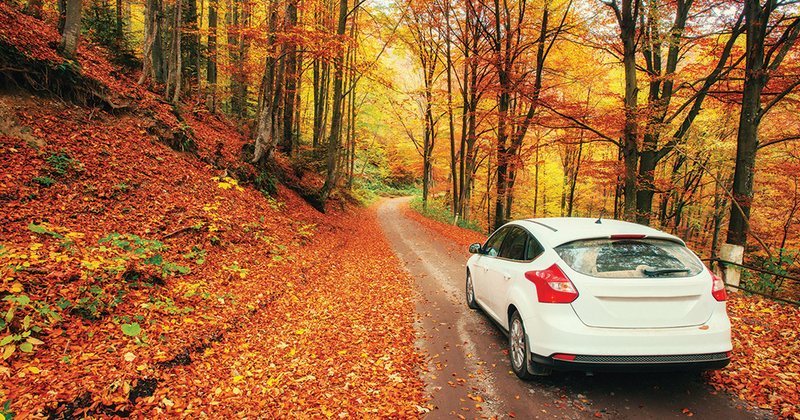 Upgrading to a newer, more fuel efficient vehicle is another strategy available for every household today. Increased incentives for rural & low- and moderate-income drivers. Overcoming the high purchase price of the vehicles is critical to achieving mainstream penetration of electric vehicles. Northeast states should consider adding additional incentives to make electric vehicles affordable for rural drivers. These incentives should include not only additional upfront rebates to reduce the purchase price of the car, but also financing assistance to help people with insufficient credit to purchase a new car. By targeting rural drivers, we can use incentive money most effectively to achieve our goals for emission reduction and cost savings. Vehicle retirement programs to take the most inefficient trucks off the road. Many rural drivers are stuck driving some of the dirtiest, most inefficient vehicles on the road. A 10 year old Ford F-150 gets as little as 14 mpg, for example. A rural driver who trades an old F-150 to a new model can save up to $1,000 per year. Programs such as California’s Enhanced Fleet Modernization Program have helped retire some of these low-emission vehicles and in the process saved money for drivers of all kinds of vehicles. Build rural charging infrastructure. Addressing rural range anxiety will require increased investment in rural charging stations. Utilities should target rural areas for support, both for public charging and for support in constructing home charging stations. Support grassroots education outreach and marketing efforts. Bulk purchasing programs such as the Drive Green program run by Green Energy Consumers Alliance can reduce costs and help consumers address the complex decisions necessary to purchase an electric vehicle. Utility programs such as Green Mountain Power’s electric vehicle program can negotiate good deals from the auto industry and help their customers make the switch to electric vehicles. These programs should be encouraged to target rural communities and drivers. As states in the Northeast and Mid-Atlantic consider new regional strategies to address transportation emissions, it will be critical for states to identify new strategies to help rural residents cut emissions and save money on transportation. One piece of a rural transportation strategy should be to enhance infrastructure that provides an alternative to driving an automobile, through expanded regional public transportation that give them easy access to urban centers, pedestrian and biking infrastructure that create vibrant communities in small towns. We should also consider how to best use innovative new transportation models facilitated by technology, such as vanpools, flexible bus routes, and ride hailing and sharing services to expand clean mobility to rural residents. At the same time, we know that realistically driving a personal vehicle will remain an important part of the transportation system for rural communities. We need to provide rural residents with the cleanest vehicles that fit their needs. We encourage states to meet the challenges facing rural drivers with bold investments that can save money for consumers and reduce pollution for everybody. This article was originally published by the Union of Concerned Scientists. Fact-check: How Many Oil and Gas Jobs Are There in West Virginia?